Hard to believe, but most federal courts and all military courts remain closed to cameras. That means that you and I — in other words, The People — cannot observe what’s going on in the judicial branch. 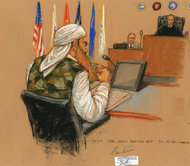 Here are some reflections on closing the Gitmo trials to cameras. How can this possibly look to the rest of the world? 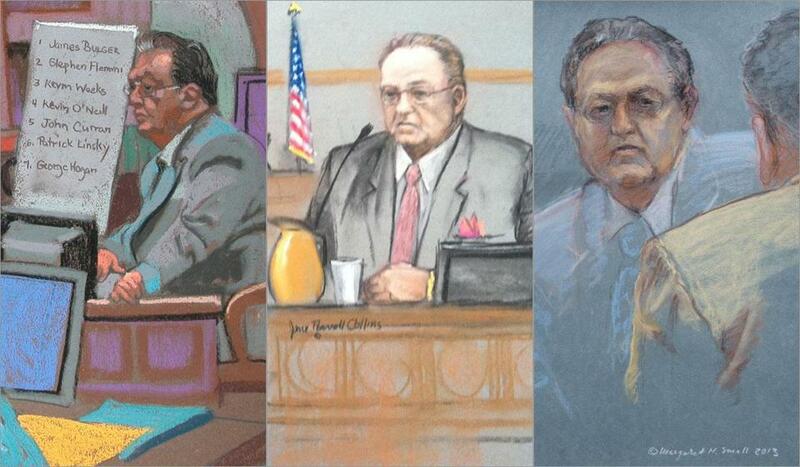 Does it signal that the high-tech United States relies on pastels to communicate? Does it signal that the big, strong America is afraid of something? The sketch artists do a great job under trying circumstances, and I would hope that they would always be welcome in courtrooms. But let’s get a video camera in there, too. TV in courtrooms? TV in statehouses? In America, where the people attempt to rule themselves, why should we not have access to even the innermost reaches of our executive, legislative and judicial branches of government? It seems to me that if we really believe in transparency, we should demand it. We should operate on the assumption that all government operations are open unless there is a really good case for closing them. –The Whitey Bulger trial in Boston is a matter of intense interest to a couple of million people in eastern Massachusetts and lots of other individuals around the country. But we cannot watch his trial on television, because video cameras are banned from federal courts. Instead, we make do with the daily work of “sketch artists,” pursuing an odd hybrid of fine art and journalism that should have gone out of business by now. TV cameras have been operating for decades in most state-level courts, and guess what? The quality of justice in the state courts has not diminished measurably. 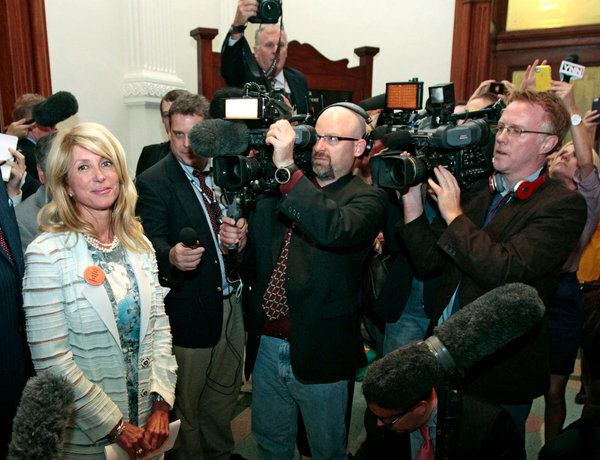 –The recent filibuster in the Texas Legislature made a hero of state Sen. Wendy Davis (and her pink running shoes). Last week, she borrowed a tactic from conservatives and waged a real, old-fashioned filibuster in order to block a bill that would have seriously rolled back access to abortion in Texas. Yes, she was aligned politically with the liberal agenda. Yes, she was very telegenic. But the only reason that she could rise to her current level of stardom is the presence of television cameras that routinely record and transmit the people’s business being done in the legislature. Sen. Wendy Davis faces the cameras. Obviously, we the people cannot attend every court hearing or legislative debate. For one thing, we are busy. For another, we would never all fit in the tiny public galleries available in most courtrooms or legislative chambers. We need access. Rev. Al, back in the day. The service is a partnership between the Times video section and a private non-profit called “RetroReport.” (It’s not that easy to find on the Times site, but here is the link to the page that lists all seven such reports done to date.) According to the partner’s website, RetroReport’s mission is to produce video follow-ups to big stories from a decade or more ago that dropped off the radar of the news business. Recent examples include revisiting the Tawana Brawley case, the Biosphere 2 experiment, and the Y2K hubbub. The folks at RetroReport seem to be a mix of young documentarians and some heavy-hitting alumni of top-shelf operations like 60 Minutes, the Ken Burns films, and PBS. of historical revisionism, giving its audience the chance to re-evaluate stories that once seemed to have one point or significance only to find that new evidence or new concerns have cast the recent past in a different light. One theme that emerges from these early versions: a lot of stories are wrong the first time around. Another theme: Despite the predictions, the sky rarely falls.